Vail Daily column: What is future of skiing? As autumn teeters on winter, the people of Colorado are faced with an exciting prospect: ski season. Yes, once again, cold weather approaches and Ullr, the ancient god of snow, is bound to bless these Rocky Mountains with a healthy blanket of powder. Then, the fun begins. Vail is scheduled to open on Nov. 18, and Arapahoe Basin just opened up Oct. 21. For those who bought an Epic Pass, 2016 offers the chance to ski two newly acquired Vail Resort Mountains — Wilmot Mountain, of Wisconsin, and Whistler Blackcomb, of Vancouver, B.C. And while Epic Pass-holders only get a handful of days at Whistler this year, it is still great news for traveling skiers. This is, perhaps, the greatest advantage of an Epic Pass: it enables holders to ski Colorado, California, Utah, Michigan, Australia, and now Canada. But that benefit comes with a few unforeseen drawbacks. 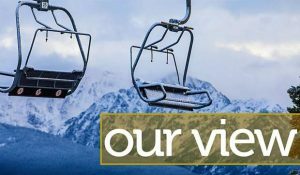 As popular as Vail Resorts has become, the mountain’s swelling crowds are almost universally despised. This is a dead horse Coloradans can be heard beating on chairlifts all over the state — “These lines are insane!”, “Where did all these people come from?” … But year by year, things only seem to be getting busier, the slopes more congested. And part of the reason is directly attributable to the Epic Pass’ expanding network of mountains. Around the world Vail is renowned as one of the greatest ski resorts on Earth. And when people have the ability at Wilmot Mountain in Minnesota, and at Mount Brighton in Michigan, to buy a ski pass at their home mountain, which also works at Whistler and at Tahoe, and at Vail, ski crowds at those larger resorts will inevitably inflate. Which is certainly a good thing for the economy and Vail Resorts. But it also means that this year’s crowds are going to be larger than ever before, as Whistler skiers and boarders add their numbers to the lift lines, along with newcomers from Wilmot Mountain. It may not be blatantly perceptible this year, or even next, but as Vail acquires more and more mountains year after year, the effect will certainly become palpable. It’s a double-edged sword. Personally, I’m stoked about skiing Whistler (and so many other mountains) on my own Epic Pass, but I’m also weary of the mobs of new tourists that entails. I’d love to ski more mountains in new places without buying a day pass at each one, but I also don’t want every small ski area to be swallowed up by corporations. Which raises another topic of concern. There’s something about a ski area that’s more genuine than what you’ll find at ski resorts. And as more mountains are added to corporate collections, the dynamic of ski areas around the world is changing. Rare are the tiny, cheap, local mountains largely unaffiliated with big business. Copious are the swanky tourist resorts targeting affluent demographics. Where is all of this headed? What does it mean for skiers and borders? How does the future look? Only time can answer those questions with any measure of certainty. But, what I can attest to is how the industry/sport has changed during my short 25 years in these mountains: the price of passes, equipment, and lodging seems to be constantly on the rise. Ski resorts can hardly grow fast enough to accommodate tourist numbers. Small ski mountains have become an endangered species. And little by little, the magic that made these mountains local is ebbing, with every new six-person lift, every new hotel, every new parking structure and parking fee. We lose something. There has to be a balance. No one is going to like a world where every ski mountain is owned by one corporate monopoly or another. But people also don’t like to buy separate passes for every mountain they want to ski. In the meantime, I’ll be waiting patiently by my window, staring hopefully into the sky, clutching my Epic Pass and waiting patiently for Ullr’s gift: this year’s long-awaited, much-anticipated ski season. Will Brendza lives in Gypsum.